One of the many beauties of photography is how we as the viewer imagine the photographs we are peering at. We imagine the person standing on the other end of the camera lens, we wonder about their life and story, and about why the photographer chose them as a subject. We occasionally imagine the subject as someone greater than ourselves, a person so fantastical, his or her reality is certainly unattainable. Another beauty of photography is that we, as artists, have the ability to express any subject in an ideal that appeals to our own narrative. We seek to enhance the imagination of others through the idealization and objectification of those we photograph. Photography is beautiful in that it allows us to be captivated by a fiction disguised as reality. The power dynamic Coburn refers to is apparent throughout the show. Coburn’s often gritty and at times highly sexualized portraits appear to be an intense collaboration between subject and photographer, with each participant in a position of control and dominance. Through Coburn’s approach, his subjects’ objectification becomes their empowerment; it is their dictation of how they wish to be imagined that comes through in the final image hanging on the wall. At first glance, Coburn’s abrasive imagery seems to conflict with the soft tones and subtle approach taken by Shipley, but these notions quickly dissolve after a full lap around the exhibition space. 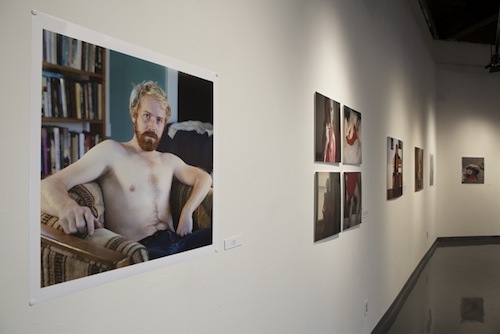 As Shipley explains of her work, “I don’t think the way the pictures of the men look are representative of men in general because the photographs are about a fictional man I am intentionally creating. It’s not about who these men actually are… it’s about something being invented. “ And that something Shipley is inventing is a conceptual blend of truth and fiction, one that derives from her own interactions with the men she photographs and how she wishes that interaction to be conveyed to the viewer. Through her own direction, Shipley commands her subjects to be what it is she wishes the viewer to imagine of these men… a product of her own objectification. Coburn and Shipley have created a show that not only contains beautiful portraits of the opposite sexes; they have developed a complex dialogue between their works that engage the viewer on several levels. Together the artists have blurred the lines between who is being objectified and how the viewer perceives and questions their own concepts of objectification. They have asked us to imagine who it is we are looking at on the wall, and to question whether it is the subject or photographer guiding our assumptions.